Summer fun at Springhill...No instructions needed. Our goal is to foster self-confidence, independence and curiosity in each child. We instill the importance of teamwork to accomplish shared goals. We respect all the forms of activity in which the child engages and try to understand them. We provide a loving and nurturing environment where each child can thrive and be happy. We believe that each child will reveal themselves through their work, play and social interactions. We appreciate your interest in our school. If you would like for a member of our staff to contact you regarding admissions or to setup a tour of our school, please fill in the information below and a member of our staff will contact you promptly. Additionally, you may request a tour of our school. Need assistance? Please call 214.946.1799 or email [email protected]. At Springhill Montessori we take pride in our ability to be responsive to the needs of each child as an individual. We strive to create a respectful, peaceful environment where students can grow and be who they are. We believe that each person  child, parent, and staff  brings something unique and valuable to our community. We are excited about our school and passionate about the educational experiences that we provide to our community. Learn more about admissions at Springhill. Thank you for your interest in applying to Springhill Montessori School. As you begin the admissions process, please note that we are prepared to assist you with any aspect of this application. Our office hours are 8:00 a.m.  5:30 p.m., Monday through Friday. We encourage you to contact us if you have any questions or you may visit our admissions process page for additional information. In case of an emergency, how should we contact you? What approach to discipline do you use? Please list any discipline problems your child may be experiencing at this time. How is the problem(s) being handled? How much time does your child spend watching television? What aspects of your child’s development would you like most to see the school help develop? Where or from whom did you first learn about the Springhill Montessori School? What immediate goals do you have for your child’s development (academics, social, emotional)? 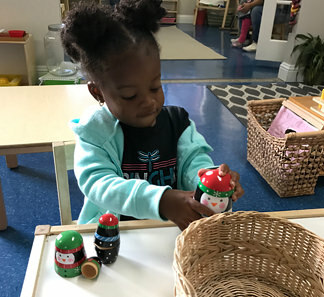 Why would you like to enroll your child in a Montessori school? Which languages other than English are spoken at home? To what extent? How does your child respond to groups? What activities does your child particularly enjoy? Who, besides yourself, is entrusted with the care of your child? In order for your application to be fully processed, a $50.00 application fee is required. Please submit the application fee to Springhill Montessori School, 813 N. Zang Blvd, Dallas, TX 75208. Subsequent to the receipt of the application and application fee, an interview with parents and child will be arranged. Parents will be notified of acceptance and the tuition deposit of $200.00 will be due at that time. Note: The $50.00 application fee and $200 tuition deposit are non-refundable. Springhill Montessori PTO is a non-profit 501(c)(3) organization. We work to build a welcoming and robust community for our families. We encourage you to join as we support our school and our community. We are currently working our first ever parent portal for Springhill Montessori parents! 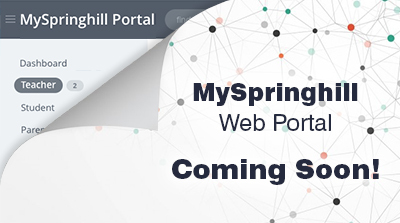 MySpringhill will be a comprehensive web portal for parents, guides and our administrative staff to collaborate, exchange information, review/authorize/sign documents, track student progress and more all from the convenience of your computer or mobile device. Our goal it to significantly reduce the amount of paperwork for school overall as well as provide some technology to help our students and families succeed at our school.